Have you ever heard the term “stack” in reference to a window treatment? Read more to find out what exactly this term means. 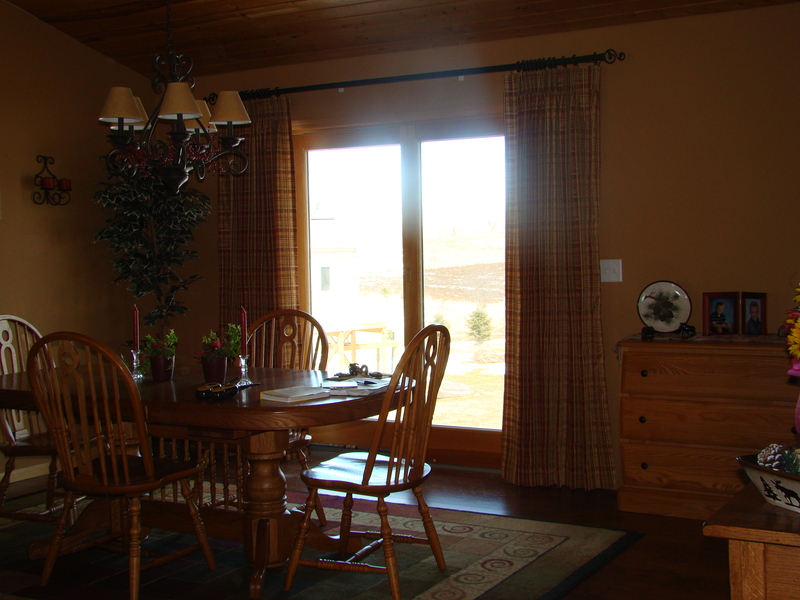 The “stack” of a window treatment refers to the amount of space the treatment takes up when it is fully opened. The stack of a blind, for example, is the measurement from the top of the headrail down to the bottom of the blind when the blind is fully lifted to the top of the window. The height of the window, along with the material of the shade or blind, determines the height of the stack. Thinner materials, such as sheer fabric or aluminum blind vanes, will result in smaller stacks. Very tall windows and thicker materials (heavy fabrics or wood blind vanes) result in longer stacks. A drapery panel also has a stack, but it is measured differently than that of a shade or blind. A drapery stack is the measurement of the fabric from left to right (or right to left), not top to bottom, when the drapery is fully opened. Why is the stack of a window treatment important? The stack takes up room – either at the window or on the wall surrounding the window. If you are not aware of the stack measurements for the window treatment product you are considering, you may have an unpleasant surprise in store when the product is installed. The stack on these wood blinds measures about 9" long. If you want to install a product with a large stack, such as a traditional Roman shade or a wood blind, and you are concerned about blocking your light or view, you could consider mounting it ABOVE the window frame. That way, when the shade or blind is fully raised, it won’t block out your light or view at the top of the window. 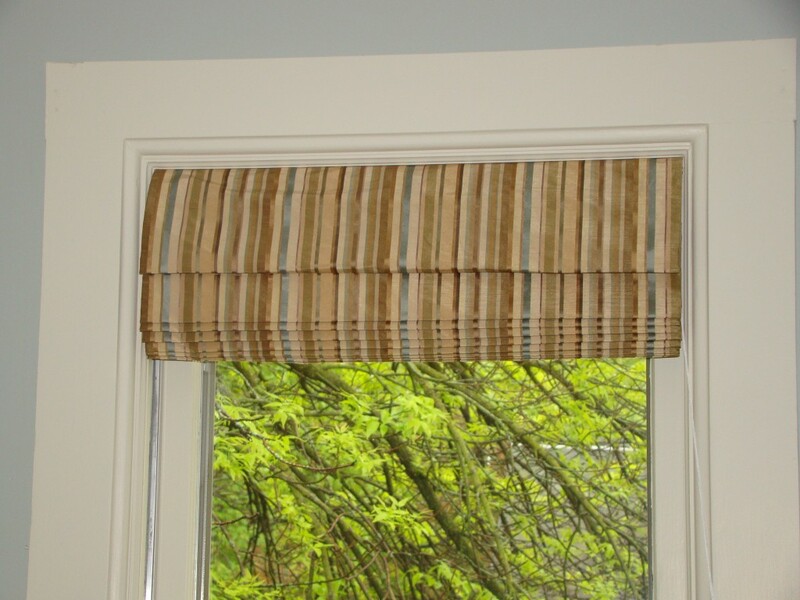 The stack on a custom Roman shade can be large, depending on the weight of the fabric and the height of the window. 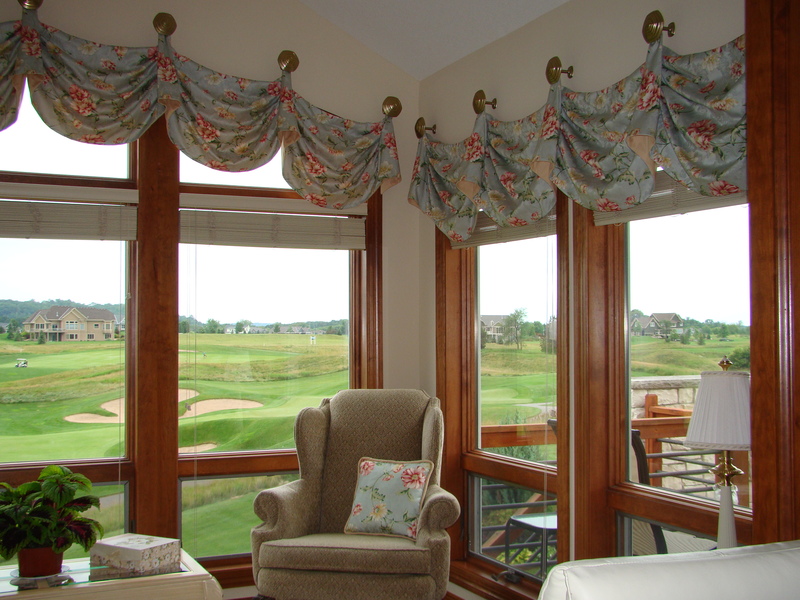 Likewise, large drapery panels can be installed to the right and/or left of the window, so when they are opened, the fabric doesn’t block a large portion of your window at each side. The stack on this pair of drapery panels is about 24" per side. They were installed to the side of the patio door, allowing room to move the fabric stack off of the glass to preserve light and view. Drapery stack is determined by both the hardware (rod, etc) used, and by the weight of the fabric; heavier fabrics take more space. The width of the window is also important; a wider window will require more fabric to cover it, resulting in a larger stack on either side. Now that you know what the “stack” of a window treatment is, you can ask the right questions when you shop for your new window treatments. 2 Responses to What is the ‘Stack’ of a Window Treatment?